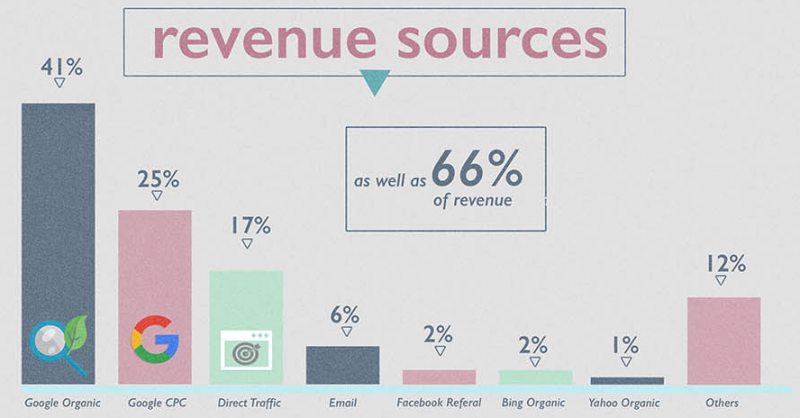 Is your ecommerce website performing well? Does it do better than your competitors? It can be difficult to evaluate your website’s performance when you don’t have any data to benchmark against. There have been plenty of studies over the years about the performance of ecommerce websites in varying niches, and the folks at Custora maintain a website that collects regularly updated information about ecommerce sites in the US. But we can always use more data, especially if it’s well-researched and presented in a clear format. That’s exactly what Wolfgang Digital have done with their new 2016 Ecommerce KPI Benchmark Study. This study is based on over 80 million website sessions and €230 million revenue generated, so it’s a significant data set. And some of the statistics that emerge from this data are quite intriguing. 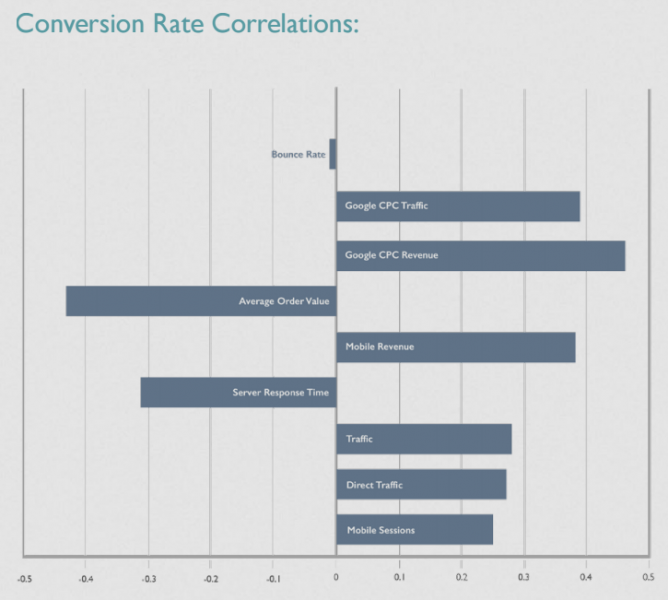 The average conversion rate of your ecommerce site should be at least 2%, right? That’s conventional wisdom in our industry and what a lot of digital marketers have been using as a benchmark to see if a site performs above or below average. 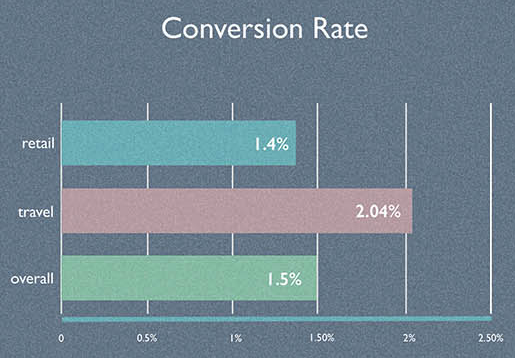 If your site has a conversion rate in excess of 2%, you’re performing above average. So if your site is managing 2%, you’re already performing above average and are beating most of the competition. It’s important to distinguish online-only retailers from multichannel retailers, though: the study shows that online only retailers convert at 2% whereas multichannel retailers (those with brick & mortar outlets, for example) have a lower average conversion rate of 1.18%. Goes to show that it pays to have a singular focus on online, and multichannel retailers often struggle to make the web work for them. Anyone working in digital marketing shouldn’t be surprised that when it comes to driving traffic to ecommerce sites, Google still rules. Wolfgang Digital’s study shows that Google sends the vast bulk of visitors to ecommerce sites: 43% of ecommerce site visits are from Google organic and 26% from Google advertising. 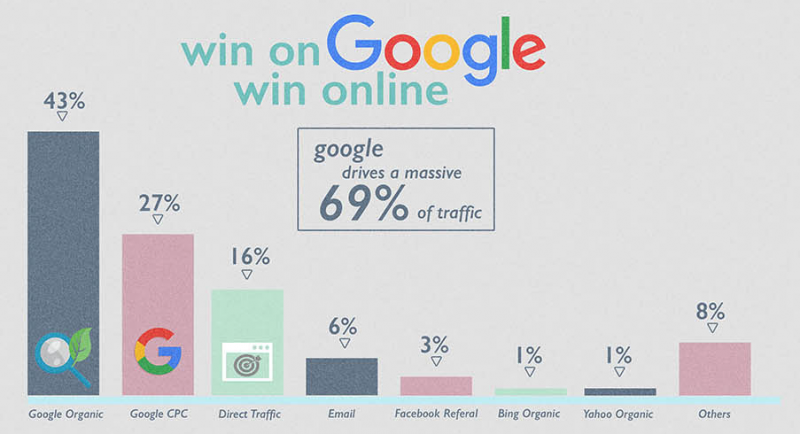 So Google on its own accounts for 69% of all ecommerce traffic. Conversions follow the same trend: Google organic accounts for 42% of revenue generated, and Google CPC add another 25% of revenue to the total. Google really does dominate on all fronts. The study also shows that social media still has a while to go before it can claim a role of any significance in ecommerce. While traffic from Facebook has grown spectacularly, from 1.3% to 5%, it still barely registers and does not contribute meaningfully to ecommerce revenue. Remember that ‘SEO is dead, long live social media optimisation‘ article from back in 2013? Imagine if you had written that… you’d feel like a right plonker right now, wouldn’t you? Unsurprisingly, mobile is claiming an ever larger share of the pie when it comes to traffic. 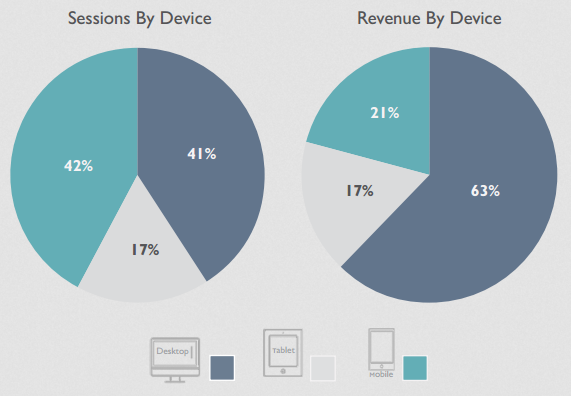 Yet that this isn’t reflected in revenue – smartphone traffic converts nowhere near as well as desktop traffic. Still, mobile ecommerce has a way to go before it can challenge desktop ecommerce. With deeper integration of payment systems on mobile phones, we could soon see a shift in consumer behaviour where mobile revenue will take a larger share. Worth keeping an eye on. For every 0.2 seconds you manage to shave off your server response time, the study shows an 8% increase in conversion rate. If that’s not a strong incentive to optimise for speed, I don’t know what is. The study has more highly useful nuggets of wisdom to offer on site engagement, average order values, assisted conversions, and much more, so I recommend you download the whole thing from Wolfgang Digital’s site here. It’s a very useful study with data presented in a clear format for you to present to stakeholders and senior management. We need data like this to enable us to fight those battles and get the budgets for projects that will really make a difference. Now a days ecommerce websites need to optimize for google rules because they expects lot for customer convenience.